Jonathan & Amy: And Football Season has Started! We love college football. 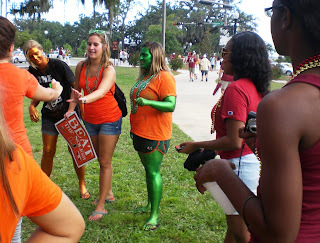 We particularly love the Florida State Seminoles. I've missed two televised games since 2000, and Jonathan's only missed a few since he was a small boy. 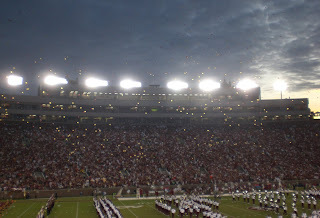 I'm now in my eighth season of going to live games in Tallahassee, the fourth of which where we've had season tickets. 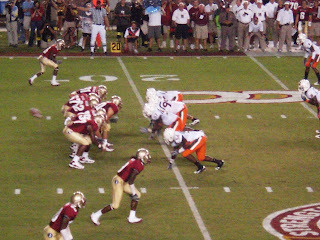 Miami games are always exciting... not only are they a state rival, they joined the ACC a few years ago, making them even more of an enemy. In 2003, the game was in a torrential downpour that found many fans in the health center with pneumonia the next week. In 2004, as South Florida drowned in hurricane after hurricane, the game was pushed back four days, and I watched on television as Miami tried to cheat by pulling a "fourth timeout" in the game. 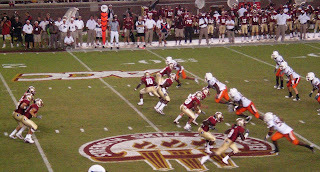 In 2005, I was among the screaming fans who saw FSU beat Miami for the first time since our 1999 perfect season. This year, things have changed drastically. I'm no longer living in Tallahassee (which was the case for 2002-2007 seasons), and we're no longer a five-hour drive away (last year's scenario). Living in Pennsylvania, the combination of flights and drives makes choosing which games we'll attend much more serious. This one was an easy pick -it's a holiday weekend AND it's a big-name game like Miami. We left Melbourne around 9am to drive up. We stopped at Chick-Fil-A twice to get our freebies (in case you weren't aware, they were giving out free sandwiches to anyone wearing a sports logo shirt on Labor Day), and got to our hotel a little after 2pm. Upon checking in, we couldn't get an internet signal in our room, and there was no dial tone on the phone, so we switched rooms (from the third to the first floor, and much nearer the front of the building), and had an extremely weak internet signal, but at least there was a working phone, refrigerator, and remote control in the second room. Long story short, don't bother staying at America's Best Value Inn in Tallahassee. Even the "deluxe continental breakfast" the next morning was poor. We headed over to the baseball stadium because I needed to pick up our parking pass (the postal service wouldn't forward it to PA), then met up with CS, Trish, and Heather at Buffalo Wild Wings. It was the absolute worst service I've ever had there, and everyone agreed. The food was still good, but when you wait an hour for it and the place isn't even packed, it better be. We literally watched another table get seated after us, order, eat, pay, leave... another party seated at the same table, then order, eat, pay, and leave... a third party was seated and had received their drinks when we finally got out of there. We would have left if it wasn't for the fact that it was game day, causing many places to be full and a lot of traffic to get from A to B. 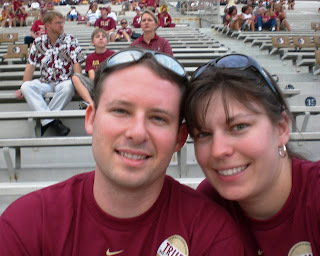 We got to the stadium about 6:10pm, after making another stop to pick up this year's True Seminole t-shirts. 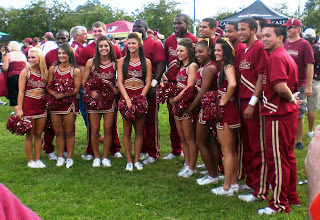 We wandered the Green a bit, and ran into the cheerleaders and a few basketball players, which was neat. 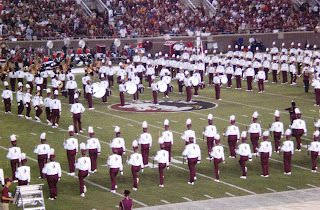 apparently this is the Miami equivalent to our gorgeous "Garnet and Gold Boys"
We were in our seats about 6:40, and we were able to watch all of the pre-game festivities. 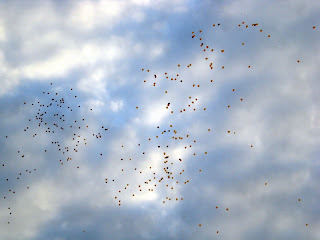 In addition to a special flyover (including the "missing man" formation and a "burn"), we also had the opportunity to release helium-filled, biodegradable balloons... too bad the student section ruined that and the whole stadium didn't have the privilege of letting their own sail up and away. 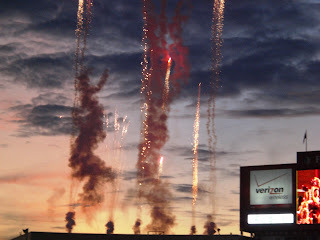 Of course, we had some fireworks to start off the game as well! The game itself was interesting... and good. We weren't playing amazingly, but neither was Miami. It was a close game, and I think everyone was surprised at how many points were being scored overall. We were all a bit saddened when newbie Hopkins missed a point, but our ability to actually pull off a two-point conversion was pretty good. There have been many comparisons to the 1991 Miami-FSU game, and with good reason. But I'll never forget those final 4 plays or so, with Ponder just throwing and throwing (but to the same person, grrr! ), waiting to make a catch. No catch was made, and we lost 39-34 in the end. It took us out of the Top 25, but it's early in the season, we'll come back!